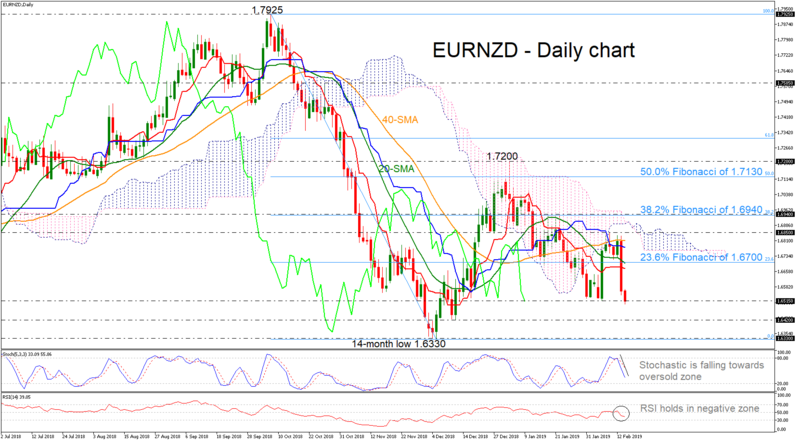 EURNZD is printing its second strong day of losses after the failed attempt to break above the area which encapsulates the 38.2% Fibonacci retracement level of the downleg from 1.7925 to 1.6330, around 1.6940. Currently, the pair is recording a fresh two-month low of 1.6500 as it also declined below the 20- and 40-simple moving averages (SMAs) in the daily timeframe. Chances for a reversal, however, are decreasing as the 20-day simple moving average dropped below the 40-day SMA, creating a bearish cross, while the red Tenkan-sen line has a steeper negative slope now, suggesting that the next move in the price is more likely to be down. The RSI continues to strengthen to the downside in the negative territory and the stochastic oscillator is approaching the oversold zone. If the price continues to head lower, investors could turn their focus on the 1.6420 support, where it bottomed on December 12. More losses could find strong obstacle at the 14-month low of 1.6330 before creating a new lower low and endorsing the medium-term bearish structure. Beneath the latter the market could challenge the 1.6140 barrier, taken from the trough on September 2017. However, if the pair reverses back to the upside, investors could move towards the immediate resistance level of the 23.6% Fibonacci of 1.6700, which holds near the 20-SMA. A penetration of this line would reinforce a bullish move until 1.6850. Higher, resistance could run towards the 38.2% Fibonacci of 1.6940. 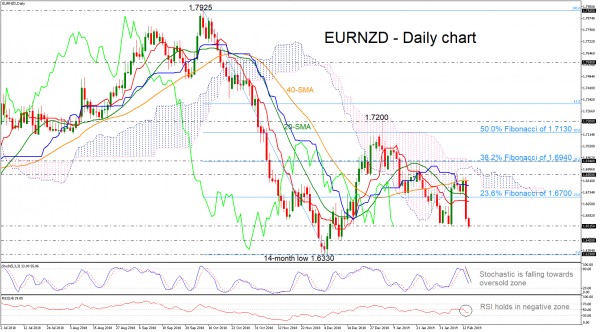 In the medium-term picture, euro/kiwi is trying to extend its bearish view, posting a negative tendency. A new lower low below the 1.6330 would confirm this structure.